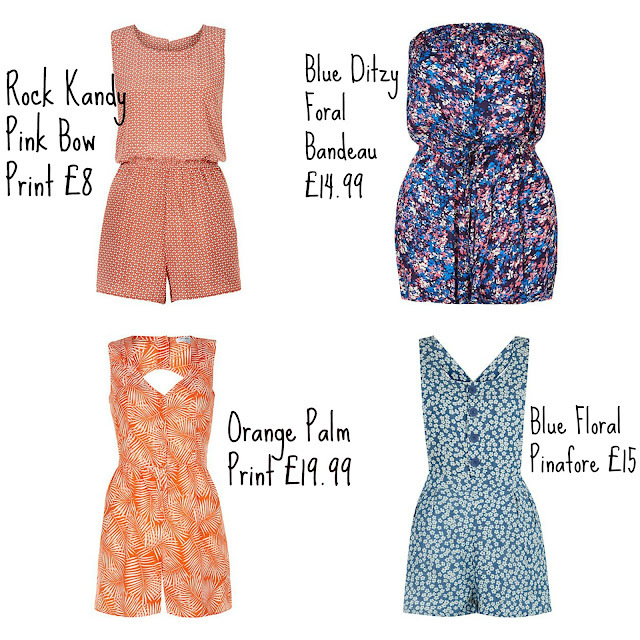 Right Up My Street: What i do best: Playsuit Picking! What i do best: Playsuit Picking! Recently I've been lusting over new Play-suit's to add into my wardrobe. I know your probably thinking I'm a bit late off the mark as summer is supposedly coming to a close and the season's are changing but I really don't think you can wrong with a play- suit, you can always dress up with some tights or leggings for the colder days and pair up with a cute knit making them an even more must have item. I tend to always buy play-suit's throughout the year because if I'm not wearing it in the day I'm most definitely wearing it on my night out - but maybe this is just me? I swear it always seems like I'm constantly shopping or looking for new clothes and am never satisfied with my current attire..
and for some reason I seem to never have enough play-suit's... I have picked out a couple from the New Look website which I love and all retail for under £20 - they are all such good value! You can find them here with a range of other Chic Play-suit's Perfect for a Day Out - Personally I have picked some of my favorites, I'm a massive lover of floral prints. With such a range of designs (and prices) its definitely worth taking a look as there's a-lot Online exclusives - which you definitely can't get your mits on in-store. Which is your favourite? Any special spots online? I really like the blue floral one! I think I nearly bought something else in the same material from new look, its just so cute! Playsuits are the perfect go-to item, I love how you can just throw them on and style them up in different ways. The palm tree one is so cute!